Some foods do more than just nourish our body; they also communicate with our cells, giving orders, for instance, to shed fat from adipose tissue, in similar fashion to certain hormones. This communication system, hitherto unknown, was revealed by Professor Johan Auwerx, thereby opening the way for new preventive and therapeutic strategies to combat obesity and cardio-metabolic diseases such as type 2 diabetes and hypertension. The discovery earned him the Danone International Prize for Nutrition in 2009. 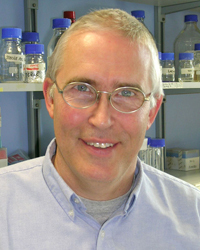 Prof. Johan Auwerx is the author of numerous publications in internationally renowned journals, including Nature and Cell Metabolism. His studies have investigated certain transcription factors (e.g. nuclear factors such as PPARs) and transcription co-factors (e.g. sirtuins or SIRT) that act as “molecular traps” for nutrients and intracellular metabolites. These proteins in fact play a dual role: they detect changes in concentrations of certain nutrients or metabolites in the environment and they react to this information by modifying transcription of the genes involved in metabolic control, thereby ensuring a suitable response. In a recent issue of Nature in April 2009, he describes the mechanisms by which transcription factors and co-factors allow the body to “sense” an energy deficit following long periods without food or prolonged exercise, before allowing the body to use this information to stimulate the release or production of energy from fat tissue (see diagram). His team showed that AMPK (AMP-activated protein kinase), an enzyme sensitive to the ratio of ATP to AMP and involved in regulation in cellular energy status, controls gene expression involved in energy metabolism by stimulating another metabolic regulator, sirtuin SIRT1 (diagrams from the issue of Nature appended). The function of this enzyme is to activate the nuclear receptor PPAR PGC-1alpha (peroxisome proliferator-activated receptor-gamma co-activator 1 alpha) as well as two Forkheadtype FOXO transcription factors. A few months earlier Prof. Auwerx’ team had demonstrated the role of these agents in fatty acid metabolism. This discovery accounts for the numerous similar effects of AMPK and SIRT1 regarding energy metabolism: they enhance metabolic reactions that generate ATP (oxidation of fatty acids and carbohydrates) and reduce biochemical reactions that consume ATP (e.g. lipogenesis). Specific activation of SIRT1 could thus stimulate fatty acid metabolism by mimicking energy demand, thereby protecting against obesity. Prof. Auwerx and his co-workers showed the ability of certain foods such as resveratrol to specifically activate SIRT1. Other studies involving a synthetic substance were published in Cell Metabolism. This molecule, obtained by Prof. Auwerx and his team, noticeably improved endurance in animals and provided considerable protection against obesity and diet-induced insulin resistance by increasing oxidative metabolism in skeletal muscle, liver and brown adipose tissue. These studies provide an understanding of how to stimulate breakdown of fatty acids stored within the body, thereby preventing obesity and associated cardiometabolic risk.